Autometrics’ shopper data is the most complete, and consistent leading indicator of new car demand for new vehicles in the US. Data for all makes and models is collected in real-time from a vast range of third party automotive websites, enabling direct comparisons within competitive model segments, even for lower volume vehicles. Autometrics Shopper data, along with the latest data science techniques, can uncover hidden patterns and key trends in consumer demand. Autometrics provides actionable intelligence about shoppers who are ready to buy. In addition, by extracting patterns from the past, and characterizing the present. Autometrics Shopper data helps to drive great marketing ROI. It is used across OEM marketing departments and agencies for multiple purposes. With such a vast data set, updated daily, Autometrics provides immediate analysis and insights. Click below to view our animated explainer video. 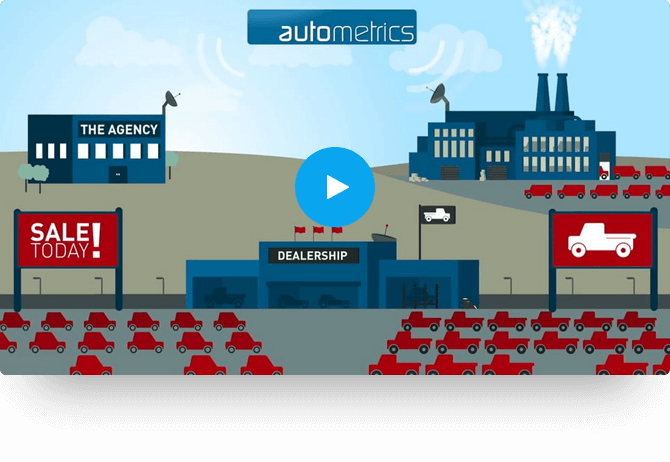 It is just over a minute long and will give you a quick overview of how Autometrics Shopper data and Data Science can help automakers make better sales and marketing decisions, faster. Provides invaluable marketing intelligence on demand for makes and models in the market, every day of the year at region and DMA level. Advertising that is focused on the mid and lower funnel must, by definition, have a direct positive impact on a vehicle’s Share of Shoppers. Autometrics Shopper data will immediately indicate the effectiveness of a product launch by tracking the Share of Shoppers against key competitors during the pre-launch, launch and post-launch periods. Autometrics Shopper data can be used to analyse the effectiveness of sponsorship opportunities by tracking a brand’s change in Share of Shoppers before, during and after the event. Autometrics Shopper data is used by OEMs to determine cross shopping threats and opportunities, providing deep insights for tactical marketing at a national and regional level. Autometrics have been working directly with OEMs since 2009, helping identify opportunities to use Shopper data to make better sales and marketing decisions. Autometrics have been supporting marketing and advertising agencies with delivering more targeted marketing and incentive campaigns. Autometrics Shopper data, at a zipcode level, can deliver valuable local insights, helping dealers to understand the impact of changing consumer demand on their business. Autometrics provides access to Shopper Data via data subscription or ad hoc analytics projects. Subscriptions are either to hourly or daily data or automated PDF visual reports.